A lot has happened in the last week, starting with last Friday when I had my annual eye doctor appointment. When I was there, he suggested that I go for a cataract removal consultation. He made me an appointment with the eye surgeon who had removed my pterygium six years ago. Then Friday night our son and daughter-in-law arrived for the weekend. One of the main purposes was to register at Babies-R-Us in anticipation of the baby shower their Cincinnati friends are having for them in a few weeks. (This will be Tom’s first baby shower--they didn’t do such back in the “dark ages” when we had our children.) True, Stephen and Michelle could have registered on-line, but I think Michelle wanted to get advice from her girlfriends who already have children. Tom has a new smoker and decided on Saturday he would smoke brisket for us. Wow--was it delicious!! It took 10 plus hours so we were tantalized by the smell most of the day. On Tuesday I went for my cataract consultation and now have surgery scheduled for one eye on June 14th and the other on June 28th. (Vision in my bad eye is very, very bad and has always been--we're hoping the surgery will reduce the great discrepancy between the vision in my two eyes.) I need to decide by Monday what kind of lens to get. I also have my pre-op physical with my family doctor that day. I'm really excited because I've heard that after the surgery most people see better than they ever had. I was very nervous when I had the other eye surgery a few years ago (it probably didn't help that that surgery was on my good eye), but cataract removal is so routine that I'm not concerned at all. Also I know from past experience that my doctor is excellent. 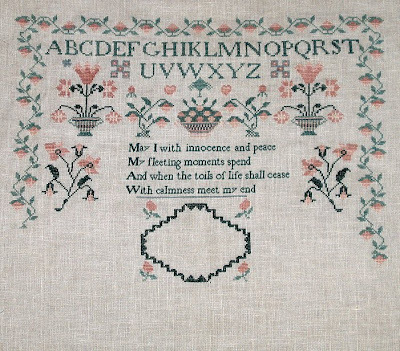 This weekend my sampler guild has a needlelace class with Doreen Holmes from England. I doubt I'll see well enough in class to get much done--boo hoo! At least after the surgery I should be able to see wonderfully. 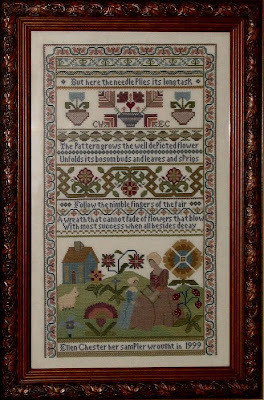 Doreen reproduced the Mary Busby Ackworth sampler that I stitched last year, so I plan to take it to the class so she can see it in person. Meanwhile, I’m working on the Deborah Walker sampler as a stitch-along with my friend, Carol. The photo below shows my progress so far. I’m just beyond the halfway point. We made a schedule that has us finishing our samplers by October 31st so we can have them framed to take to our sampler guild’s Christmas party. In 1999, Carol and I did another stitch-along--The Embroideress by Joanne Harvey (The Examplarery). I think I did mine on 32-count linen, and Carol did hers on 28-count. We both “signed” our samplers with our own initials and each other’s. I hope you have a nice weekend lined up. Most of mine will be spent at my guild's workshop, but I'm hoping to also pick out the linen and threads for a new design, a hornbook needlebook. Ooooh, a hornbook needlebook?!?! Gotta have it! Can't wait to see the new design. Good luck with your eye surgery. I hear it works wonders and hope it will do so with you. And your work is just gorgeous! Might have to look up those two charts as well. Have a blast at your guild weekend! It sounds like so much fun. Good luck with your surgery. I hope your vision is much improved and give you many more years of stitching. I love your Deborah Walker. What fabric/count are you using? I have this pattern in my files. Good luck with the eye surgery, too. Your Deborah Walker is gorgeous! And The Embroideress too! Good luck with your eye surgery. Best wishes for your cataract surgery! Have fun at your class. Love Deborah Walker and the Embroideress sampler :-). My BIL is a smoker and he made a brisket that was just fantastic. I don't know how long he smoked it, but it sure was good. Love your Deborah's sampler. That's probably one that I should look into getting since it is my name! Good luck with your eye surgery. My mom had that a couple years ago and she was so thrilled with the results. Good luck with your eye surgery, everyone I know who has had it done has been happy with the results, so I take comfort in that knowledge knowing it is in my future too. Oh the samplers are so pretty, you do such beautiful work. I need to look into the guild in Cincinnati. Years ago when I was child bound I wanted to join but couldn't swing it. Thanks for sharing your beautiful work. Best of luck with your cataract surgery Ellen. I'll be thinking of you when that time comes. Your work is just beautiful! I do look forward to any new designs. Best of luck on your surgery!!! Hoping your eye surgery(s) go well Ellen. And thank so much for sharing your beautiful stitching...just lovely. Have a wounderful week! I'm sure your eye surgery will go without a hitch and you'll be able to see great afterwards. My parents, aged 85 and 79 can both see to read without specs now, which is more than can be said of me I'm afraid. I love all of your samplers! Your eye surgery will be a great improvement. I had both of mine removed in 2001 and can work on 40 count with my Mag-Eyes. I am a nurse and worked with cataract surgeons. When you have the first one done, look at a piece of white paper with the bad eye and then the good eye. Think how great the colors will be after you are all done!